Move over aluminum foil, wax paper and parchment paper! There’s a new sheriff in town–COOKINA! 3 lucky Appetite For Health fans will win COOKINA Non-Stick Sheets! How many of you have non-stick pans? How many of you don’t have to use aluminum foil, wax paper or parchment paper on your non-stick pans? I bet it’s not many. Maybe you spread some type of fat across your pan like olive oil, butter or crisco, but that can add a lot of calories. Sometimes I spray my pan with cooking spray, which saves me some calories but I’d rather not have that extra flavor with my fresh food. So, when I found COOKINA, a fat-free way to bake and grill and keep my oven clean, I literally jumped for joy! COOKINA is so easy to use! 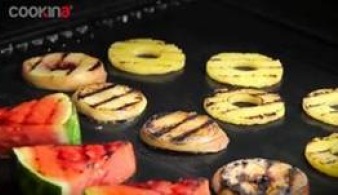 All you have to do is place COOKINA Barbecue Reusable Grilling Sheet on grill, then place food on the sheet. You’ll see that none of the sauces seep through so you won’t have to clean up caked on, burnt juices. What’s really cool about the Barbecue Reusable Grilling Sheet is that it achieves professional level grill marks and all you have to do is simply wipe the non-stick sheet off and reuse all summer long! The oven protector is my special favorite. You lay it down in the bottom of your oven and slide it out when you’re done baking. No scouring on your hands and knees needed! Tell us below your stickiest cooking moment. Entries will be accepted until midnight EST, Friday, March 14, 2014. Remember to check back here to see if you won! Bar-B-Q chicken in the oven can be quite sticky. I used wax paper to bake something instead of parchment paper and not only did everything stick, it started to smoke! I had to pull that thing out before the smoke alarm went off!!!! As a cater, we do lots and lots of cooking and looking for innovated ways cut down on messes in our pans is an ongoing thing.! A couple of our most stickiest thinks are caramelized bacon which we make for our cupcakes also we cook a lot of jack fruit and cleaning it is a gooie mess and if these things work as they claim??? It will work for prepping our jack fruit as we prep them in sheet pans . I have already liked the Cookina facebook pages, posted on their page. Would,love to win this as I am curious if all of there are reusable? Looking at the box and the way the packaging looks it appears as if if it a roll of sheets?like ones that use and throw? Are they all reusable? Even the grilling ones? Truly curious about trying these! If they work good … Ill be sharing this with all the chefs I know here in CA ! Also grillingVegan food on a grill we do meat on is just not ok so having a barrier on our grill to allow NO cross contamination and being able to have vegan grilling would be suburb! Without having to grill in on an iron griddle. KUDOS,! Liked you, liked them, and got the news letter! I was baking not grilling some candied nuts and it said to separate with a fork on parchment paper. What a mess and burned my fingers too! Baking sweet potatoes always ends with a sticky mess in my house. I would love a reusable green way to bake my fruits and veggies without mess. My fish got stuck on the foil. Things get sticky when I cook with my niece! 🙂 She can make a mess with most foods! For me its saucy liquid things like with bbq, cranberry chicken sauce,I guess I’m messy too. Twice baked potatoes with extra cheese. Stickiest cooking moment? First time I tried grilling pizza. These sheets would sure prevent that, though! I am always getting the chicken stuck on the grill! Burnt on fat/grease drippings from meatloaf. In my new college apartment with my new stainless steel skillet that SAID nonstick, I made scrambled eggs in it. I ruined the skillet. Obviously, I was inexperienced in the kitchen. :). I subscribe to Appetite for Health. I “Like” Appetite for Health on Facebook. I “Like” Cookina on Facebook. I tried melting caramels in a pan on the stove as I did not have a double boiler and what a mess. The caramels stuck and burned to the pan. Chicken parmesan which was tricky and spilled. Liked AFh, subscriber and cookina. Not checking the bottom of a frozen pizza before putting it on a metal baking sheet. Bottom must’ve been covered with cheese–the pizza was “glued” to the sheet after baking. Tore up the pizza trying to pry it off. Sigh. I didn’t know that huge salmon filet was going to stick to the grill, then fall through the grates as I tried to unstick it! I’m an email subscriber (susitravl at gmail dot com) and I like you and Cookina on FB. When I grill veggies they all stick! Trying to make caramel corn – what a yummy mess! Well one time I tried to make toffee and instead of it breaking into alot of pieces it turn in to a sticky pan. I LIKE you you both on Facebook and am subscribed to your e-mail newsletter. There are tooooo many sticky messes that I have had on my pans. One of them is when I tried to make caramel and chocolate chip cookies. I must have made them with too much, because some of them stuck so bad I had to throw away my pan and the others dripped in my oven and I had to scrape and clean my oven twice. My son needs to use this for his pizzas so they don’t drip meat, cheese, and fat into the bottom of my oven!!! What an AWEsome idea!!! A breakfast casserole made with eggs, cheese, potatoes and sausage-took days to soak off. Caramel Corn, oh what a mess! No matter what I do, I end up scrubbing the sticky residue from BBQ’d chicken. I tried to make my husband’s favorite pie from a recipe given to me by my mother in law. It had corn syrup in it and when I baked the pie, all the corn syrup bubbled out onto the bottom of my oven and created a burnt sticky mess. Wings and nachos always stick to the pan! I could sure use these!